We’ve all planned a pub crawl or two, or at least those of us old enough to drink have. You get the bus or a taxi to one end of town, start at the Dog & Duck for a pint before moving on to the Queen’s Arms, the Bull’s Head, the Crown and finally the Traveller’s Armpit, or whatever. Easy, right? Wrong: here’s how to do it properly. 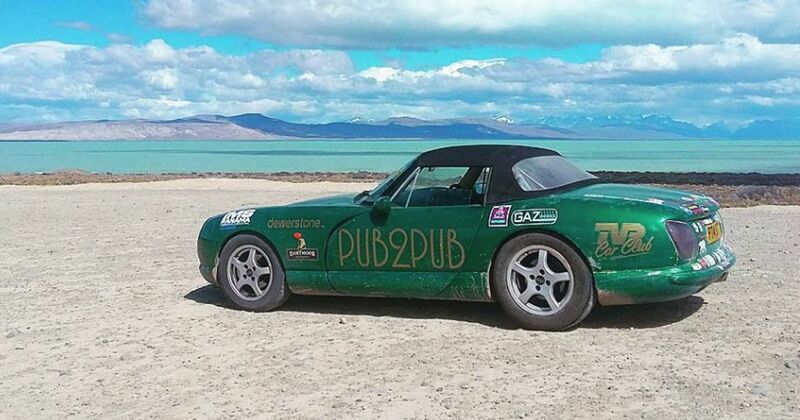 Ben Coombs, from Plymouth in the English south west, has driven his 20-year-old TVR Chimaera from the northernmost pub in the world to the southernmost. With plenty of refreshment stops along the way. Starting in the UK he drove to the hotel bar in Pyramiden, on a Norwegian island far from the mainland, Coombs and the Chimaera, known as Kermit, were just 700 miles from the North Pole. A short drive and then a transfer back to the Norwegian mainland let him drive through much of Scandinavia and northern Europe before returning to England. The car was then shipped to Cuba, where Coombs no doubt enjoyed a suitably local drink. He and Kermit then hopped on to New York. A journey across the US followed, taking him to California before heading south into Mexico and beyond. Another ship transfer bridged the Darien Gap between Panama and Colombia. The huge South American section lasted 8000 miles of a total of over 20,000. He navigated the Bolivian Altoplano and the same country’s Death Road that you might remember from Top Gear’s Bolivia Special, not to mention the punishing gravel we saw in the fateful Patagonia Special that caused ridiculous controversy because of Jeremy Clarkson’s number plate. His final destination was Tierra del Fuego, the archipelago shared by Chile and Argentina, where the world’s most southern bar proved to be “a bit of a dive, actually,” according to Coombs. He’s now arranging for Kermit to be shipped back to the UK. What an achievement. The idea for the epic ‘Pub2Pub’ pub crawl came, as you might expect, after a few beers. He already had Kermit, he had the ambition, the experience and the resources to make it happen. The rest was pure adventure. Some of Coombs’ friends joined him for various short sections, too.